Explosive emails suggest the Brexit campaign’s biggest donor met with Kremlin-linked figures multiple times before the referendum. The emails, seen by the Sunday Times, alleged that Arron Banks, the millionaire businessman who funded Brexit campaign group Leave.EU, was reportedly offered a business deal involving six Russian goldmines. It forms part of a mounting pile of evidence that Russia attempted to influence British democracy and engineer the EU referendum in favour of Brexit. LONDON – The Brexit campaign’s biggest donor secretly met with Russian officials multiple times before the referendum to discuss business opportunities, according to an explosive report. 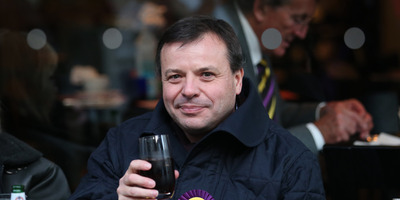 Arron Banks, the millionaire businessman who funded pro-Brexit campaign group Leave.EU, was reportedly offered a business deal involving six Russian goldmines. The Sunday Times report, based on a huge cache of leaked emails, also alleged that Banks also had undisclosed meetings with Alexander Yakovenko, the Russian ambassador to Britain, set up by a suspected Russian spy, and that he visited Moscow before the referendum in a previously undisclosed trip. Banks and Wigmore were introduced to Yakovenko by Alexander Udod, a suspected Russian spy who was expelled from the UK after the poisoning of Sergei and Yulia Skripal. Banks made a previously undisclosed visit to Moscow in February 2016, months before the EU referendum. Ultimately, Leave.EU lost the battle to be designated the official “leave” campaign to rival organisation Vote Leave. But the group played a significant role in the referendum, bankrolled by Banks to the tune of over £12 million and credited with using Trump-style shock tactics to generate press coverage. After learning about the allegations on Saturday, Banks and Wigmore announced that they would not appear before MPs to answer questions as part of an inquiry into fake news.